It was June 2016. Liz and I had our first rental property humming and we were starting to save aggressively for the next one (with cash of course – we figured it would take about 2 years). At the time, the Dow was at $17,400 (the highest it had ever been) and the stock market had already been flailing for an entire year. And that’s when I saw it. The double top…!! The Double Top? What the Heck Am I Talking About?? Back in my college years, I was way more interested in stock investing than I am today (these days I’m all about investing passively in index funds). From those early years, I remembered specifically hearing about double tops – a technical investment term that I was hoping was about to make me rich! Alright, so what exactly are we talking about here…? Warren Buffett…he’s NOT a technical analyst. He’s what you’d call a fundamental investor – meaning he buys solid companies that will likely grow because of their track record, their leadership, and their product. Technical analysts don’t care about any of those things. The only thing that matters in technical investing is the movement of that line on the chart. 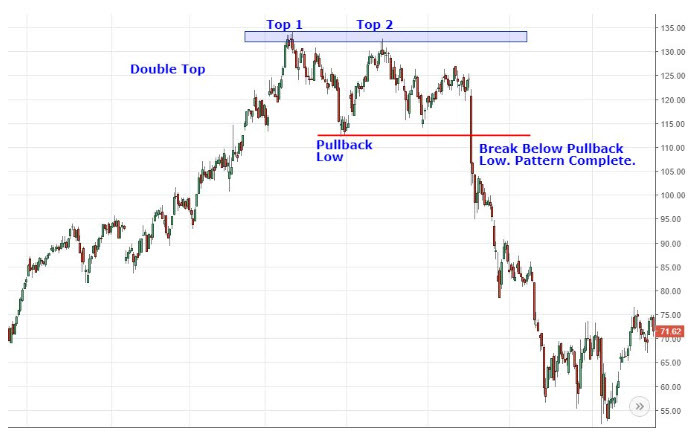 If the market hits a “double top” and then breaks below the “pullback low”, watch out! It’s getting ready to tank! Looks a heck of a lot like the chart of the Dow on June 20, 2016, right??? (really, stop and take a look again. It’s like an exact match!!). Pair this with the uncertainty of the 2016 U.S. election… I decided it was time for me to strike!! The stock market was sure to tank…likely in just a matter of days! I sell our silver for $2,000-$4,000 and put that toward our next cash housing purchase. 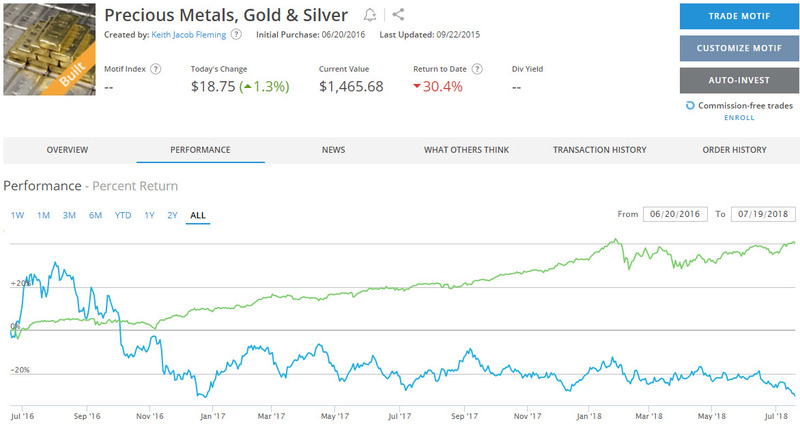 Fifteen days after I invested $1,000 into precious metals (mainly silver), the values jumped and it was suddenly worth $1,230! I was up 23% on my money and I was just 2 weeks in! Most people would be ecstatic if they earned that return over the course of 2 years! I mean, check this out! Things couldn’t have been going better. 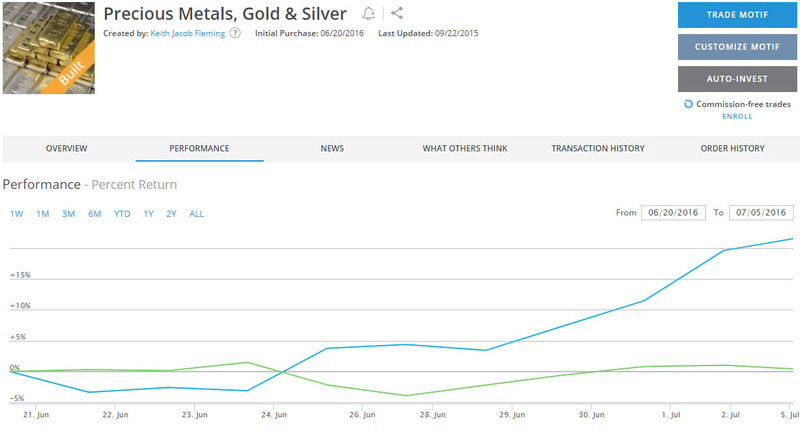 (Blue line is the precious metals value, green line is the S&P 500). Skyrocketing, baby!! Since that date, my gold and silver investment has never been the same. Because of the apparent strength of the market, my hedging investments started to plunge. By October, my investment was worth just $950. Then…to add insult to injury…I was so confident that the market would plunge and my silver would skyrocket once again that I doubled down! I tossed another $1,000 into the mix assuming that silver would once again jump to that 23% gain (or more) and I’d be the genius that earned $460 instead of just $230. As you can probably guess…it didn’t quite work out that way. Here’s the rest of the chart… The S&P 500 takes off…and my precious metals plummet… Womp wommmm…. To date, I’m down $550, or roughly 30% over the course of 2 years. Not exactly the track record I was hoping for… Like I said….my worst investment decision to date…Pretty terrible. Instead of trying to time the market and make it big with a hedge investment, I’ve discovered it’s far wiser to just invest in a few different index funds. Overall, I know my investment is far more likely to go up than down (thanks to decades of history on these markets). Thankfully, my silver investment was only $1,000 (well, actually $2,000 after my “genius” double-down move). This story could have been far worse if I had thrown our entire savings account into the mix. Sure, we lost $500, but it wasn’t money we were depending on. Plus, I’ve got the luxury of holding onto this investment with the hope that it will eventually go up when the overall stock market softens (hey, it could happen!! ;)). Have you ever pulled a bonehead move like me? Have you made an investment that you thought was a sure deal and it turned out to be the mistake of a lifetime? What’s your story? What’s YOUR worst investment decision to date? The post My Worst Investment Decision To Date… appeared first on Life And My Finances.